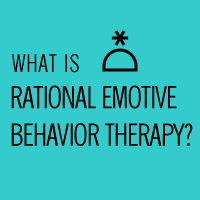 Today’s psychology focus is on Rational Emotive Behavior Therapy or REBT. All Cognitive Therapy is based on the belief that humans’ basic motivation is to survive. This aligns with current research efforts in the area of Brain Elasticity and the basic premise that when you perceive a threat (real or imagined), the body gets triggered into “flight and fight,” otherwise known as the stress response. Over extended periods of time, this has a negative effect on your physical health. This form of therapy was originated by Albert Ellis, a renowned Columbia University psychologist (who passed away in 2007) considered the father of the Cognitive Therapy. Other forms of Cognitive Therapy include Brief Therapy, the work of the Aaron Beck Institute, Reality or Choice Therapy, Schema Therapy, Dialectical Therapy, and Acceptance and Commitment Therapy. I’ll be describing each of these in upcoming posts. What are the psychological tools a counselor might use in an REBT session? The counselor teaches you the A-B-C model of psychological disturbance and change: A) what was the activating event that triggered your response? ; B) what did you tell yourself, your belief about what just happened? ; C) consequence, what did you do in response, how did you behave? Exploration of “Common Thinking Errors” and how you may be operating from one or more of these. Examples include: All or Nothing Thinking – absolute, seeing no middle ground; Labeling – assigning meaning to someone or some thing that does not accurately reflect reality, Irrational Should Statements – “I should have” or “They should have”, Magical Worry – believing your worry can prevent an unwanted situation. After identifying the common thinking errors that reveal an inaccurate or distorted response based on familial, social, and cultural influences, the counselor assists you in re-interpreting the situation with more insight and awareness. You will then repeat each of the A-B-C stages utilizing the new associations, beliefs, and likely positive consequences to support your overall desire for resolution.